Governor Godwin Obaseki of Edo State has assured that his administration would not forget the legacies left behind by late Dr Samuel Ogbemudia, who was former military and democratic governor of the old Mid-West and Bendel States. The governor stated this while giving his tribute at the interdenominational funeral service in honour of late Dr Ogbemudia at Samuel Ogbemudia Stadium in Benin City on Friday. He said, “Let us not forget him and what he has left behind. On the part of the government of Edo State, I want to assure you that we will not forget him”. Governor Obaseki also noted that late Ogbemudia would be remembered for his uncommon passion for service to God and man. In addition, he thanked eulogised the life of the deceased saying that he was a great leader, mentor and father. 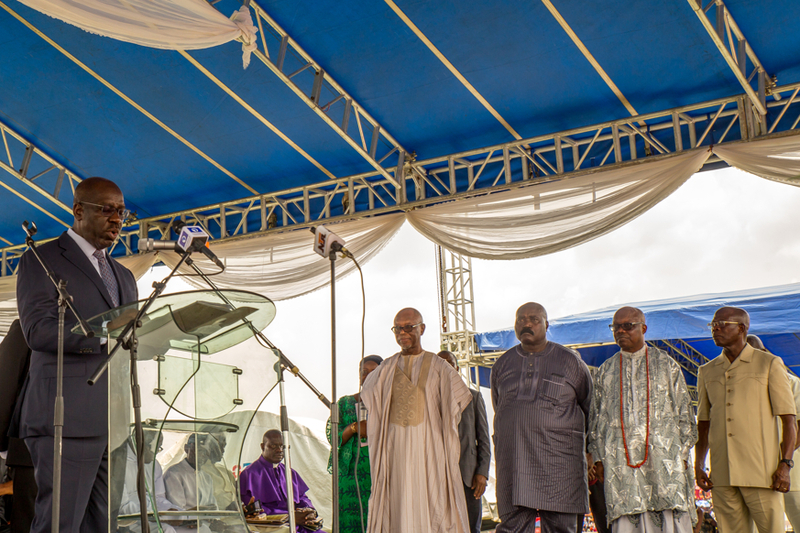 The governor commended President Muhammadu Buhari and others, who had condoled with the family of the deceased, even as he thanked those who graced the event. He also thanked the management of the University of Benin Teaching Hospital and the Lagoon Hospital in Lagos for the level of care given to the deceased before he passed on. For his part, the Governor of Delta State, Dr Ifeanyi Okowa, in his tributes described the deceased as a visionary leader whose leadership style would continue to inspire generations after him. Praising the former governor, he said, “Dr Ogbemudia’s overriding passion was for peace, progress and development, and he would relate and work with anyone who shared those values, irrespective of their political affiliation”. Okowa, represented by his deputy, Mr Kingsley Otuaro, added that the courageous part late Ogbemudia played during the political crises of 1966 would forever be remembered.